Sexton Blake is a fictional detective crying out to be rediscovered in the 21st century. He was known nationally and internationally as “the great detective” and for present-day enthusiasts he is still worthy of that description. Many of the Sexton Blake stories rival the Sherlock Holmes stories in their quality, yet Holmes has remained in the public eye while Blake has been allowed to slip into obscurity by all except for a few devotees. Sherlock Holmes television dramatisations are really great but they have been screened ad infinitum, and they are still appearing daily on satellite channels (Spring 2002). On the other hand there is a goldmine of Sexton Blake material just waiting to be discovered by television producers. Perhaps they don’t know where to find the published stories as, unlike the Sherlock Holmes stories, they can’t be found in bookshops or public libraries. Most of the original publications are in the hands of collectors, as are the few more recently published hardback volumes of facsimiles. However, there are Old Boys Book Clubs where Sexton Blake enthusiasts meet and the London Branch of the OBBC holds a vast library of Sexton Blake stories (originals and facsimile copies) and they are available for loan to members at a very small charge. 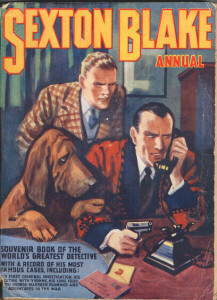 Sexton Blake is a fictional detective with similarities to Sherlock Holmes. They appeared on the scene within a few years of each other, the first Holmes story being published in 1887 and the first Sexton Blake story in 1893. Both are portrayed as private consulting detectives operating from London’s Baker Street. Both are bachelors, though there is often a strong hint of romance in the Sexton Blake stories, Yvonne Cartier being the object of Blake’s affection. Blake and Holmes both employ a housekeeper ~ Mrs. Hudson looking after the Holmes’ residence and the equally strong character of Mrs. Bardell attending to domestic arrangements for Sexton Blake. Both detectives have an assistant but whereas Dr. Watson is a mature medical man, Sexton Blake’s assistant is a young man (late teens or twenties) called Tinker who addresses Blake as “Guv’nor” or “Chief”. Sexton Blake also has a bloodhound named Pedro. Holmes and Blake both work amicably with the Metropolitan Police. Sexton Blake often works closely with Detective Inspector Coutts, a dependable but unimaginative bowler-hatted, plain clothes policeman of stocky build and ruddy complexion. Blake and Coutts share a mutual respect based on many years of working closely together in their battles with the criminal fraternity. Despite the similarities between the Sherlock Holmes and the Sexton Blake stories, there are also a great many differences. 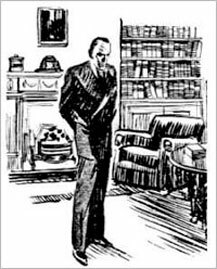 All the Holmes stories came from the pen of one man (Sir Arthur Conan Doyle) whereas many authors wrote Sexton Blake stories, some rivalling the talent of Conan Doyle. 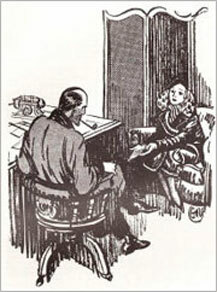 Indeed for millions of readers, particularly in the 1930s, there was only one Baker Street detective – Sexton Blake. Blake does not share the familiar Sherlock Holmes characteristics – hooked nose, deerstalker, twisted calabash pipe and violin. Nor does he spend much of his time relentlessly pacing his chambers in his dressing-gown. Sexton Blake does not resort to opium to heighten his awareness. Blake is portrayed as a clean-cut man of indeterminate age, but probably between 39 and 42. He is tall at 6′ 1″, slim, but muscular and broad shouldered. His hair is dark, his eyes blue-grey and expressive. His hair comes down to his forehead in a deep V. He is well educated, having obtained a medical degree, though he has never practised as a doctor. Blake is a smoker of cigarettes and pipe tobacco, and he has the occasional glass of spirits. He owns a Rolls Royce Silver Ghost called the Grey Panther, and also holds a pilot’s licence.